The Olmec were the earliest known major civilization of Mesoamerica or Pre-Columbian America. It is thought that early Olmec culture appeared around 1600 BC and it flourished from 1200 BC to 400 BC in the tropical lowlands of south-central Mexico, in the present-day states of Veracruz and Tabasco. Much of what we know about the Olmec civilization is dependent solely on archaeological evidence. As a result not much is known about the Olmec and, though evidence points at several possibilities, most of the things have not been established with certainty. What is known is that the Olmec produced some of the greatest Mesoamerican artworks including colossal sculpture in volcanic stone and intricate works in jade; they built the earliest known Mesoamerican pyramid; and laid the foundations for all subsequent Mesoamerican cultures such as the Maya and the Aztec. Due to lack of concrete evidence, several points regarding the contribution of the Olmec civilization are still debated and this is mentioned in the article where ever it is applicable. Here are the 10 major achievements of the Olmec civilization of Mesoamerica. Mesoamerica is a term used to describe the region roughly corresponding to modern day Mexico and Central America which was inhabited by various societies before Spanish colonization following the famous discovery by Christopher Columbus. It is one of the six sites that current scholars consider as cradles of civilization, where civilization emerged independently. The Olmec civilization prospered from around 1400 BC to 400 BC in the formative period of Mesoamerica. It is regarded as the first major Mesoamerican civilization and it laid many of the foundations for all subsequent Mesoamerican cultures such as the Maya and the Aztec. Many of the hallmarks of Mesoamerican societies, like ritual bloodletting and the famous ballgame, were initiated by the Olmecs. The Olmec civilization is thus known as the “mother culture” of Mesoamerica. The Olmec civilization produced the earliest sophisticated art in Mesoamerica and their distinctive style provided a model for later civilizations in the region, like the Maya and the Aztec. 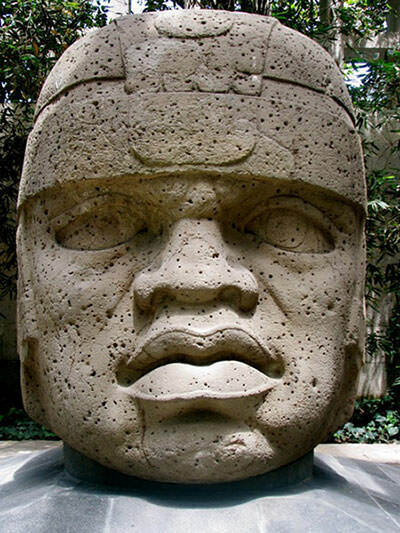 Olmec art is most famous for colossal sculpture in volcanic stone and intricate works in jade. Hallmark of Olmec art is the incredible attention to detail which can be found in not only miniature works in jade but also in monumental stone sculptures. Olmec artists were revolutionary for their time and they produced some of the most outstanding artworks created in ancient America. In addition to human subjects, Olmec artists were adept at portrayals of anthropomorphic creatures and animals; and apart from their mastery in sculpture, they had command over the art of cave painting. Olmec carvers had complete mastery over the difficult miniature medium and they produced some of the finest and most intricate pieces of miniature art by any Mesoamerican culture. Small sized Olmec artifacts prior to 900 BC were often made in ceramic while after that they created their pieces in jade and serpentine, materials that required great skill to carve. Olmec mastery in ceramic works is often noted by experts. However, their most renowned pieces are in jade. Olmec artworks in jade are considered to be unsurpassed in the ancient Americas for their compactness, symmetrical balance, three-dimensional form and elegance of surface detail. 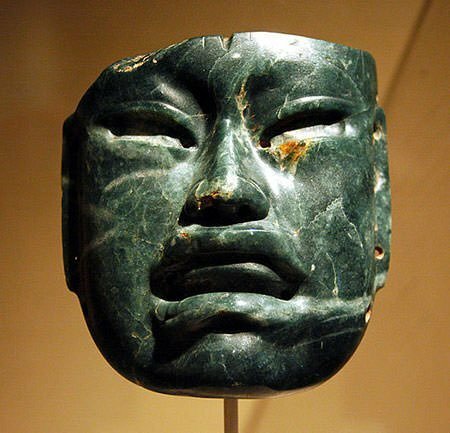 Nearly all major museums of the world have at least a few pieces of Olmec jade. The Olmecs were the first inhabitants of the Americas to construct monumental architecture and the first to develop a sophisticated style of stone sculpture. Olmec monumental art may be divided into a number of categories like colossal heads, altars, seated figures, free-standing figures, stelaes, etc. Around 250 examples of monumental Olmec art have been found till date; most of them from the sites of San Lorenzo Tenochtitlán, La Venta and Laguna de los Cerros. 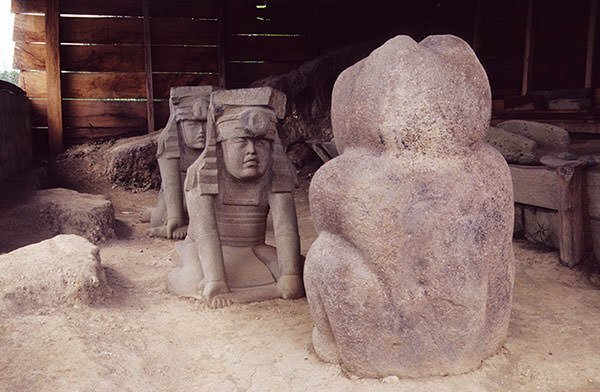 Among the most famous Olmec monumental sculptures is a pair of nearly identical seated human figures facing a jaguar, which was discovered at the El Azuzul site near San Lorenzo. They have been described as “some of the greatest masterpieces of Olmec art”. Monumental stone representations of human heads sculpted by the Olmec, known as the Olmec colossal heads, are the most famous legacy of their civilization. They show the head and face of a helmeted man with distinctly indigenous features. They are not carved all the way round with their backs being flat; and were probably meant to be viewed from the front and sides. 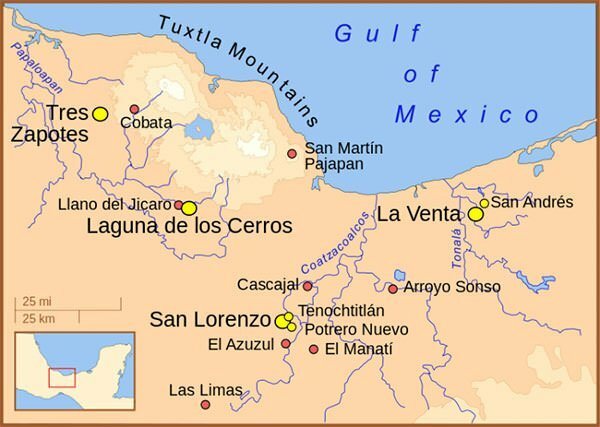 17 Olmec colossal heads have been found till date; 10 at San Lorenzo, 4 at La Venta, 2 at Tres Zapotes and 1 at La Cobata. They vary in height from 1.47 to 3.4 meters (4.8 to 11.2 ft) and are estimated to weigh between 6 and 50 tons. It is not known with certainty who these massive monuments represent. The most widely accepted theory is that they are portraits of powerful individual Olmec rulers. All of the heads are realistic, unidealised and frank descriptions of the men. There is a great deal of speculation and debate regarding how the Olmec accomplished various tasks required to create these colossal heads like transporting such massive stones to the sites. However, the Olmec colossal heads definitely indicate the advanced organizational and artistic skills of the Olmec civilization. Front view of Colossal Head 1, discovered at San Lorenzo. The four major city-temple complexes that the Olmec build were San Lorenzo Tenochtitlan, La Venta, Tres Zapotes and Laguna de los Cerros. Following the decline of San Lorenzo around 900 BC, La Venta became the most prominent Olmec center. The central building at La Venta is a structure known as The Great Pyramid. Constructed almost entirely out of clay, it is the earliest known Mesoamerican pyramid. It is estimated that it was constructed between 1000 BC and 400 BC. Even today, after 2500 years of erosion, the Great Pyramid rises 34 m (112 ft) and contains an estimated 100,000 cubic meters of earth fill. It was the largest Mesoamerican structure of its time. The Great Pyramid was originally a rectangular pyramid with stepped sides and inset corners. Its current conical shape is probably due to hundreds of years of erosion. The ancient Maya civilization of Mesoamerica are renowned for their mathematical and astronomical knowledge. Among other things, they had developed the concept of zero centuries before the Europeans; and had a sophisticated and complex calendar. The Long Count calendar used by the Maya was a non-repeating calendar representing the number of days since a mythical creation date. As the six artifacts with the earliest Long Count calendar dates were all discovered outside the immediate Maya homeland, several researchers believe that this calendar predated the Maya and was possibly the invention of the Olmec. The Long Count calendar requires the use of zero as a place-holder. Hence it is also speculated that the Olmec may have devised the concept of zero. The word Olmec means “rubber people”. The Olmec extracted latex from rubber trees growing in the region and mixed it with juice from morning glory vines to produce rubber several millennia before vulcanization was developed in the 19th century. Among other things, they used it to create bouncy rubber balls to play the famous Mesoamerican Ballgame. The rules of the game are not known with certainty. It is speculated that two teams were involved. The aim of the offense was to move the ball towards the opposition and into a ring about 25 feet above the playing field. The aim of the defense was to force the offense to lose control and to allow the ball to touch the ground. The Olmec are often credited with inventing the Mesoamerican Ballgame but this has not been established with certainty. In the late 1990s, a writing-tablet-sized block of serpentine was discovered from a site near San Lorenzo. Known as the Cascajal Block, it shows a set of 62 symbols, 28 of which are unique. 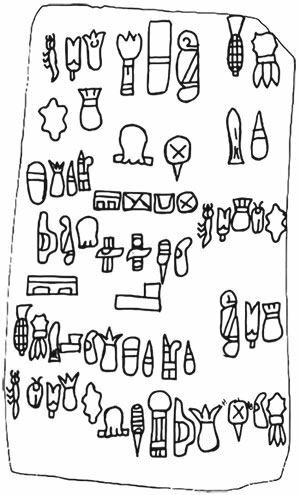 A large number of prominent archaeologists have hailed this find as the “earliest pre-Columbian writing”. The Cascajal Block is dated to the San Lorenzo Tenochtitlan phase of the Olmec civilization, which ended around 900 BC. Thus its find precedes the oldest Zapotec writing by approximately 500 years. The Cascajal Block may thus represent the earliest writing system of Mesoamerica making the Olmec the first civilization in the Western Hemisphere to develop a writing system. However, there is still a lot of debate regarding the authenticity of the Cascajal Block. An artifact, known as M-60, was found at the Olmec site of San Lorenzo. It has been dated by radiocarbon methods at 1400 BC to 1000 BC. It has been established that M-60 would be fully operational as a lodestone floater compass. 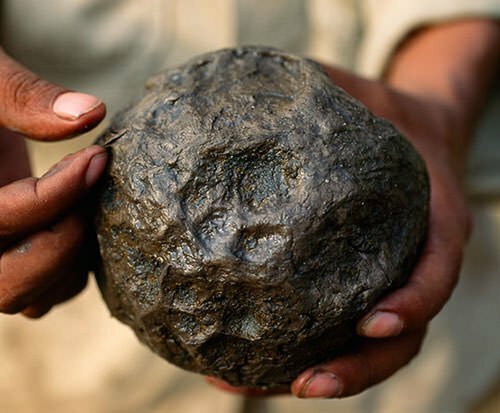 The analysis of M-60 thus indicates that the Olmec may have discovered the geomagnetic orienting properties of lodestone, as did the Han Chinese. Thus they probably used the geomagnetic lodestone compass earlier than 1000 BC. This predates the Chinese discovery of the compass by more than a millennium. Given the incalculable importance of the magnetic compass, this might be one of the greatest achievements of the Olmec.